In some ways, it’s ironic that I was instructed to avoid “travel writing” for this blog, seeing as Study Abroad is, at its core, about travel – or at least, is contingent on some sort of long-term travel and living in a new place. In other ways, however, it’s completely understandable. People read this blog to understand Study Abroad – the new experiences, the challenges, the tips and tricks – and not to hear about my adventures in New Zealand. Now that I’m back in the United States, somewhat jetlagged, and reflecting on my time in New Zealand, I have nevertheless noticed some similarities between my travel and the overall Study Abroad experience. I did a lot of traveling in New Zealand, but perhaps my most notable trip was the ten day roadtrip of the South Island that I embarked on in June with my girlfriend Maddy. The course of our journey around the South Island mirrored my own longer term stint studying and living in Wellington, New Zealand. We started off on the ferry, a four-hour trip over somewhat choppy seas that in many ways reflected my twenty-four hours of flying from Chicago to Los Angeles, L.A. to Auckland, Auckland to Wellington. Travelling, even to a place I had been before, was at once a nerve-wracking and exciting experience. I was ready to explore new horizons but still a little wary of leaving my comfort zone behind. Rainbow over a river near Nelson. The first couple days of the road trip continued this mix of contradictory emotions, eagerness punctuated with worry. On the one hand, we spent the first nights driving through the dark, trying to find campsites and set up the tent before the rain got too heavy. On the other, we explored the West Coast of the South Island with fervor, stopping frequently for photos and so on. This was the period in which everything was new and shiny and despite the challenge we found ourselves sightseeing enthusiastically. Similarly with Study Abroad. My first few weeks in the country were unlike anything that followed. 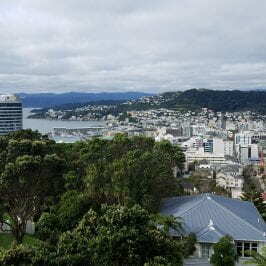 School wasn’t slated to start until I’d been there for a month, so I spent my days hiking the mountains around Wellington, exploring the city, and situating myself. I regularly woke up and found myself thinking, “I can’t believe I’m actually in New Zealand!” Sure there was nervousness, but my excitement easily overwhelmed that. Then I began to settle in and get the hang of things. I moved into the University-run hall, met my roommates, and got back into the rhythm of attending classes. On our road trip, we continued down the West Coast and then drove inland through glacier country and the lakes district. By this time, we’d become pros at setting up and taking down the tent in a matter of minutes, whipping up hot meals on our little gas stove, and hitting the road early to get as much done as possible. The lakes district, from the summit of Roy’s Peak. Those two people waving our arms are Maddy and I. By the time we drove across the country to the east coast town of Oamaru – which has New Zealand’s largest Little Blue Penguin colony! – we were a well-oiled machine, more than capable of handling anything the road threw at us. This was just past the midway point of our trip. In Wellington, meanwhile, I quickly became accustomed to my new life and again began to wander outside my comfort zone. It was around this point that I wrote my piece on independence abroad for this blog. By this time, I was facing few significant challenges. 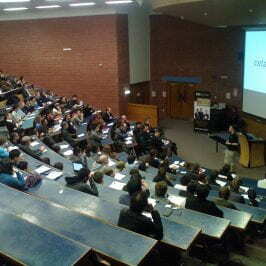 I had built up an effective support network in New Zealand for the few instances where I did struggle, but was otherwise enjoying my time and my studies. This is not the way everyone’s Study Abroad experience goes – I know from speaking with others that the struggles can be substantial at times. I was fortunate that I already had some artifacts of a support net there when I arrived and lucky that due to my previous travel here the culture shock and sense of missing home was never quite so powerful. The indent our tent left in the frost after we packed it down one morning. The last phase of the journey is always the most complex. You’re stuck between viewing the trip as already over and wanting to enjoy your last few days on the road. Everything passes in somewhat of a blur – particularly for Maddy and I, as we raced north through road closures from earthquakes in order to make our ferry home the next day. There are still solid memories and good times – seeing a whale on the ferry back is perhaps the most notable of these – but the sense of sadness that tinges the end of a trip lingers with those remembrances. My last few weeks in New Zealand were like this as well. I had finished University and spent my time as I had when I first arrived, exploring the city, venturing out on 17km hikes on the sunny days and huddling indoors watching the rugby when it rained. Every time I visited Maddy at University felt like it would be the last and I found myself constantly saying goodbye to everything and everyone I came across. View of Wellington from one of my walks. Then, finally, it did come to an end. The end of our road trip was a bit confusing – we spent much of the day unpacking and the rest getting used to being back home. Sleeping in beds instead of a tent was nice, to be sure, but the sudden shift in lifestyle was still a bit difficult to grapple with. My week back in the states has been similarly confusing. I have in some ways experienced a form of reverse culture shock. This manifests itself in small ways – Why is everyone driving on the wrong side of the road? Why is tax added to things after I buy them? – but also in larger ways. I still get a bit of a chill when I see a cop with a gun, for example, before I remember that that’s normal here. The constant bombardment of advertisements that you’re met with here in the States is a bit overwhelming at first, though I’m certain I’ll grow used to it in time. Even the simple act of switching seasons from winter to summer and traveling backwards 17 hours has offset my body clock a bit. Returning to Amherst will no doubt subject me to a similar sense of dissociation as I get used to a different academic and college life from the one I’ve grown used to. I mentioned earlier that I struggled very little while on Study Abroad, but I’ll amend that statement now. Perhaps the greatest challenge for me has been returning from Study Abroad and engaging with a brand new and yet still-familiar Study At Home.